VKIT Located in a pollution free environment surrounded by lush greenery in a sprawling 26 acres of land. State of art laboratories and online library that provides advanced engineering skills with trained staff . . .
At Vivekananda Institute of Technology, We value every individual in our care and it is our aim to provide the best possible academic environment in which students can succeed. Our campus has grown from its inception in 1997 to accommodate over 1200 + pupils in first-class teaching facilities which are amid beautifully kept surroundings. 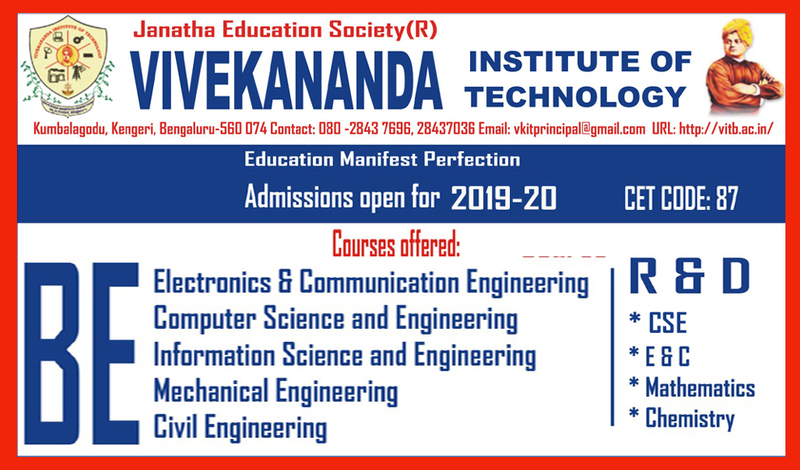 Vivekananda Institute of Technology currently offers six full time Undergraduate courses in Engineering three full time Master Programs and three Research programs. Focusing on innovation, continuous improvement and with service orientation, the institute is committed to making a difference to all of its stakeholders.The ambiance and serenity of a world class infrastructure housed in a lush green campus, faculty who have proven record in their teachings. 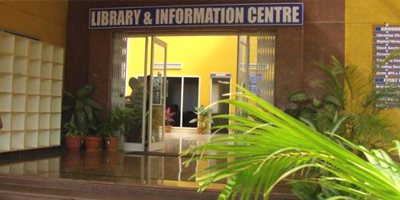 All the Library operations have been fully computerized, it has our own Institutional Repository Facilities (Digital Library), Online cataloging, e-resources facilities, Forums facilities etc., All Library services are providing through Mobiles or Systems in 24 X 7 for the benefit of the students and staff. At Vivekananda Institute of Technology, we value every individual in our care and it is our aim to provide the best possible academic environment in which students can succeed. Our campus has grown from its inception in 1997 to accommodate over 1200 pupils in first-class teaching facilities which are amid beautifully kept surroundings. We are fortunate to have a talented, highly committed teaching and supporting staff to ensure the learning environment of our students is the best it can be. Our Janatha Education Society provides the fabric with which the tapestry of our students experiences unfolds. Optimism, tradition, inclusiveness, service, compassion, tolerance, hope and faithfulness are the underpinnings of the institution education. It is in this context that our students learn. Vivekananda Institute of Technology is a vibrant learning community that encourages a three-way partnership between students, parents and the college. The strength of that partnership is reflected in the success of our students. The likelihood of achieving this is strengthened by the fact that we offer an academic program that includes breadth and depth is rigorous and which can be tailored to individual needs. We encourage high academic standards and have high expectations of personal discipline and motivation from our students. These are the keys to success in life after graduation. Engineers and Managers play the most vital and important role in nation building. They create new inventions using best engineered technologies to make human life more comfortable, secure and productive. In modern times, nations which have rich engineering and experienced management domains are flourishing economically and are providing better lives to their people. We have excellent potential to grow in diversified areas and excel in engineering and management fields. We need enormous number of engineers and managers to write next story of success. The essence of engineering and management education which has spread in India is a very positive sign not only to cater domestic needs but provide manpower to the entire world and become biggest technically trained community. Janatha Education Society is a venture contributing to this Endeavour. We have started with full force to play a leading role in providing quality education and careers. We have identified the needs of modern engineering technology and management education for modern age students, with a vision and mission accompanying transparency,accountability and accessibility which keeps us abreast and also ahead of our competitors. Vivekananda Institute of Technology was established in year 1997 as a comprehensive institute based on new educational concepts. It has inherited the traditions of its predecessors, starting with Vivekananda degree college, which was founded by the Janatha Education Society in 1982. The philosophy of human resource development rooted in our institute is expressed with the phrase Education Manifest Perfection. Closely interpreted, it emphasizes the need to be kind hearted to others, much like parents and teachers and to have the ability to bring people together, as well as to solve problems rationally. By applying the above phrase, I believe that our mission is the creation of knowledge aimed at finding solutions for emerging global tasks and the making of a future society, including the cultivation of human resources who will take the initiative. Since its establishment, our institute has aimed to promote constant reforms in order to create a flexible education and research organisation as well as a new educational system that would meet the needs of next generation. Even as we have advanced in specialized area of expertise, we have actively developed new cross-disciplinary approaches to education and research. Amid this rapidly changing global society, the functions of a institute need to be restructured and we realise that it is our responsibility to take the lead role in conducting such a reform.